Not to be confused with Commander in Chief or Colonel of the Regiment. Colonel-in-Chief is a ceremonial position in a military regiment. It is in common use in several Commonwealth armies, where it is held by the regiment's patron, usually a member of the royal family. The position was formerly used in the armies of several European monarchies. A Colonel-in-Chief has a purely ceremonial role in their regiment. 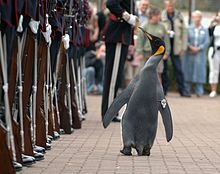 The Norwegian Army has taken a more whimsical approach to the position, appointing the penguin Sir Nils Olav as a Colonel-in-Chief. By the late 19th Century the designation could be given to the children of royalty; pictures exist of the daughters of Russian Czar Nicholas II in the uniforms of their regiments. The German Kaiser Wilhelm II carried the title to an extreme, holding it in literally dozens of German and (by diplomatic courtesy) Austro-Hungarian, British, Russian, and Portuguese regiments. In addition, his mother, wife, son, and daughters were also full or deputy Colonels-in-Chief of various units. In modern usage, the Colonel-in-Chief of a regiment is its (usually royal) patron, who has a ceremonial role in the life of the regiment. They do not have an operational role, or the right to issue orders, but are kept informed of all important activities of the regiment and pay occasional visits to its units. The chief purpose of the Colonel-in-Chief is to maintain a direct link between the regiment and the royal family. Some artillery regiments have a Captain-General instead of a Colonel-in-Chief, but the posts are essentially the same. 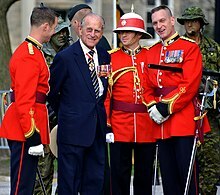 The position of Colonel-in-Chief is distinct from the other ceremonial regimental posts of Colonel of the Regiment and Honorary Colonel, which are usually retired military officers or public figures with ties to the regiment. Colonels-in-Chief are appointed at the invitation of the regiment.[when?] While it is traditional for a royal personage to hold the position,[not in citation given] it is at the discretion of the regiment or corps[clarification needed] whom they invite. In the past non-royal persons have held, or been invited to hold, the post of Colonel-in-Chief. The Duke of Wellington was Colonel-in-Chief of the regiment that bore his name, whilst Winston Churchill was Honorary Colonel of the 4th Queen's Own Hussars, the regiment he served in before entering politics. The Governor General of Canada Adrienne Clarkson was invited to be Colonel-in-Chief of Princess Patricia's Canadian Light Infantry, while the Royal Australian Army Medical Corps decided to ask the Governor-General of Australia to serve as its Colonel-in-Chief. These exceptions, however, do not change the raison d'être of the post, which is to serve as a personal link between regiment and Monarch. The role has spread to other armies in the Commonwealth of Nations, at least in countries which have royal families. ^ a b "Military penguin becomes a 'Sir'". BBC News. 15 August 2008. Retrieved 13 September 2015. ^ See this list of Colonel-in-Chief appointments held by The Prince of Wales. ^ "Her Majesty Queen Elizabeth II accepts Royal Appointment as Colonel-in-Chief of the Canadian Armed Forces' Legal Branch". Department of National Defence. Retrieved 19 October 2013.